The train that my brother Stan and I took from Paris to Frankfurt arrived at just before 1300hrs on Saturday, 15 September. Our trip from the train station to the airport, where the travel agent had reserved our car, took a while. So it was around 1400hrs before we had the rental car. Fortunately we added a GPS navigation system to the rental to make it easier to find our way around. Stan, having lived in Germany for seven years, already knew all of the major roads. However, we intended to visit some places like Kürnbach and places in eastern France and Belgium. So we felt the navigation system would be money well spent. We left the airport heading almost straight south past Heidelberg and a couple hours after departing the airport we arrived in Kürnbach. In late May or early June of 2010, I discovered that our Garn ancestors had lived in Kürnbach and had come to America in the mid to late 1700s. In Kürnbach the name of the Garn family was spelled Gern. But there is no doubt that it is the same family. The evidence appears in my book, The Garn Family including Carn, Garnes, Garns and Gern. 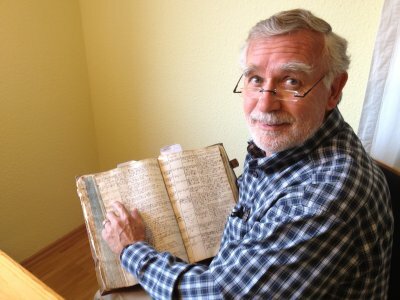 From the time I discovered that Kürnbach was the ancestral village of the Garn family, I wanted to visit the village, walk the streets, stay in a guest house, eat at the restaurants, visit a vineyard, visit the church where their births and christenings were recorded, and see their names in those the old record books at the church. So I was quite excited when we arrived at the village. 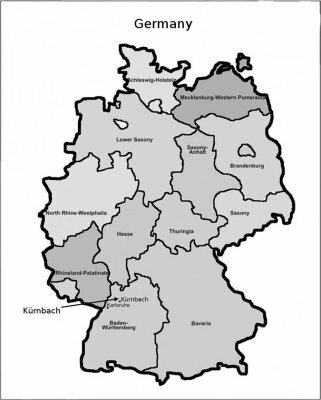 The map below shows where Kürnbach is located in Germany. Most of the Germans who left Germany to come to America left to escape religious persecution. The region in Germany that most of them came from was known as the Palatinate. Technically Kürnbach doesn't appear to be in the region known as the Palatinate. However it is close. We don't know for certain why our ancestors left Germany. However, it is likely that they left for religious reasons. The GPS coordinates of Kürnbach are 49.078104N, 8.845232E. Click on the coordinates to see the location on Google Maps. These coordinates point directly to the village square in front of the city hall. The old Evangelische or church is located on the north side of the square. Kürnbach is so small that many Americans who have visited and even have lived in Germany have no idea where Kürnbach is located. However, most Americans who have been to Germany know where Heidelberg is located. And many also know where Karlsruhe is located. Karlsruhe is also shown on the map above. Kürnbach is located about 30 miles south-southeast of Heidelberg. And it is about 25 miles east-northeast of Karlsruhe. 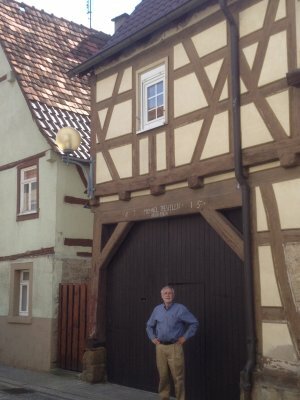 A German friend, Karlheinz Bers, had made reservations for us at the Kürnbacher Hof, a guest house in Kürnbach. The picture below shows me standing in front of the guest house. Like most of the buildings in the middle of the village, it has the half-timber design that was used more than 500 years ago. I don't know how old the Kürnbacher Hof is. A book about guest houses that is mentioned below indicates there was an inn with a vaulted celler on the site as early as 1465. The pictures below show two more views of the Kürnbacher Hof. The picture on the right shows the vaulted celler or archway mentioned above. 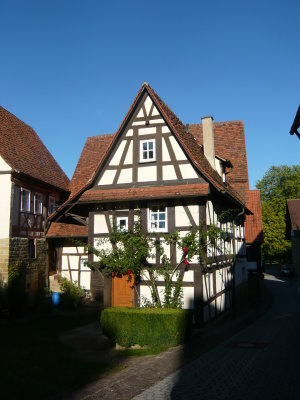 The Kürnbacher Hof is a typical guest house like you would find in other small villages in Germany. It is clean, well run, and designed to make guests feel at home. 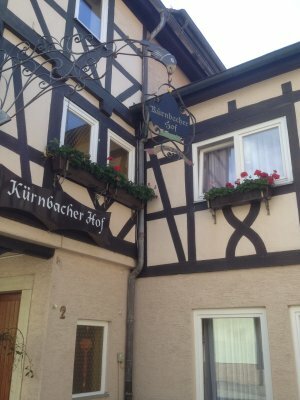 For anyone who wishes to visit Kürnbach and stay the night, I would recommend staying at the Kürnbacher Hof. 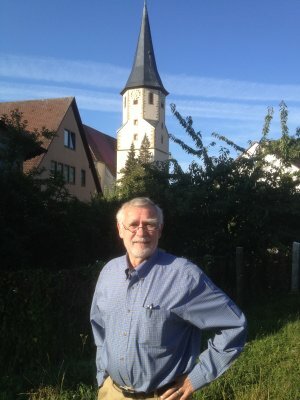 A well-known local historian and author, Reinhard Schmid, from the Kürnbach area has written many books about the history of the area. 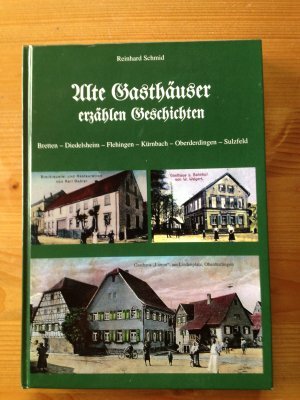 One book that he wrote was titled, "Alte Gasthäuser erzählen Geschichten: Bretten, Diedelsheim, Flehingen, Kürnbach, Oberderdingen, Sulzfeld" which translates to something like, "Old Inn Stories from Bretten, Diedelsheim, Flehingen, Kürnbach, Oberderdingen, and Sulzfeld." These villages are all clustered within about eight miles of each other. Pages 183 - 189 of this book tell about the Kürnbacher Hof. 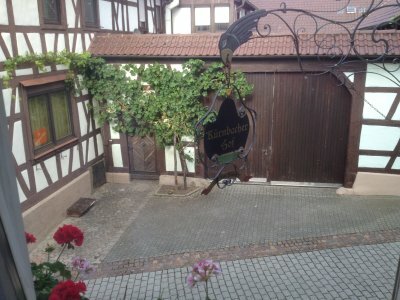 The picture below is the view out the window of my room at the Kürnbacher Hof. The green along the far wall is a grape vine. In the foreground one can see a black sign for the guest house. And below one can see the brick streets that characterize the center of the village. 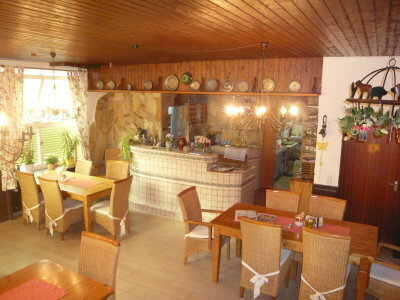 The picture below shows one of the dining areas in the Kürnbacher Hof. The kitchen is barely visible through the far doorway. One thing I love about Germany is the breakfasts that they serve in guest houses. And the breakfasts at Kürnbacher Hof were no exception. Stan and I had excellent breakfasts both mornings we were there. We also ate two excellent dinners in this room the two evenings we were there. Another large room in the guest house is used for large parties and receptions. The picture below is me with Frau and Herr Binder. Manfred Binder is the chef. And as noted above, the meals were excellent. 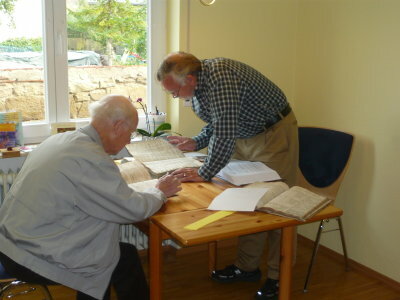 The Binders have owned and operated the Kürnbacher Hof for several years. I can't say enough about the wonderful reception that the Binders gave us at the Kürnbacher Hof. They made us feel welcome in the guest house and the village. Although Herr Binder did not speak very much English, we were able to communicate enough to get by. Frau Binder speaks English as do their children. We met their son Wolfgang and their daughter Alecia. Stan met another daughter. The Binders have a web site for the Kürnbacher Hof which may be visited by clicking here. If you paste the URL/address into Google Translate, it will translate the pages into English. 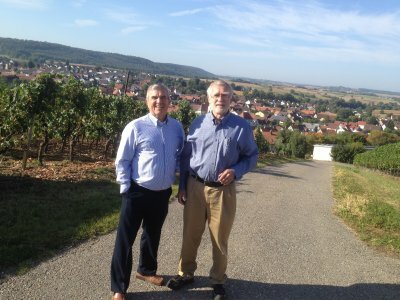 After checking into the Kürnbacher Hof, Stan and I decided to walk around the village to see some things. As we were driving into the village, we noticed a large gathering of people at a building near the center of town. It appeared as though there were more than 100 people. Being curious, we approached the edge of the group and asked if anyone spoke English. The person with whom we spoke indicated that he would get someone to speak with us, whereupon he went off and brought the man pictured with me in the photo below. His name is Ralf Svoboda and we talked for some time, learning that he had just returned from the United States and loved everything about the US. You can see from his hat and tie that he does. It was only after we had talked for a while that we learned the gathering was actually a reception for Ralf and his wife who had married about three months before and had spend the time since their marriage in the United States. They had just returned and were attending a reception given in their honor. We had a really good time talking with Ralf and others at the reception. They had to get pictures with us and we got the picture above with him. Another person we spoke with at the reception was Claudia Martus-Ehrmann. She is an English teacher in a nearby village. I believe she said she taught high-school age students. As you would expect of any English teacher in Germany, her English was excellent. She was quite interested to know that we were visiting the village because I had traced our family roots back to the village. It is probably worth noting here that we had no problems communicating with the people in the village. As we walked around that Saturday afternoon, on Sunday, and again on Monday morning, we frequently saw groups of three or four people. When we approached them and asked them if they spoke any English, one of them invariably would answer, "A little." Then the person would proceed to speak in excellent English that put to shame any German that we thought we could speak. The point here is that they were always willing to talk with us in English and that we were usually able to communicate at some reasonable level. Near the site of the above mentioned reception is a wall next to which were growing several grape vines. Kürnbach is well known for the wine produced in the area. 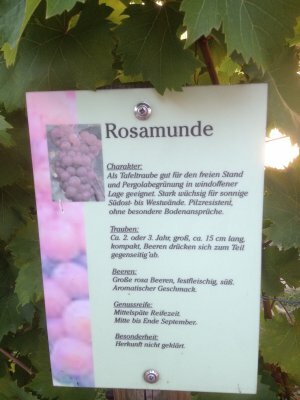 There were signs with the grapes growing by the wall showing the varieties of grapes that are grown by the vintners in the area. The pictures below show the types of grapes grown in the area. 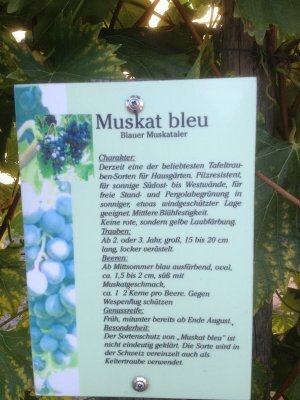 The Muskat Bleu grape may be the one that they use to make the Schwarzriesling or Black Riesling wine that the region is known for. That wine is hard to find in the United States. I know because I've looked for it at a lot of places. The French also make the wine and market it by the name Pinot Meunier, which is easier to find. Later in this story I tell how we got some of the Muskat Bleu grapes. They were really great. I'd love to be able to grow them myself. The picture below shows one of several beautiful wrought iron designs that can be found in the village. 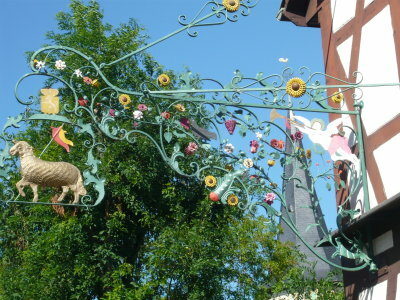 This was at the site of a former Hessian guesthouse, "Zum Lamm," Note the flowers, angel blowing the trumpet, bird, sheep and flag. The picture below is the Rathaus or City Hall. On Monday morning we stopped there hoping to speak with Frau Elke Dörlich, a lady that Stan had spoken with two years ago when he went to Kürnbach at my urging to take some pictures for my book on the Garn family tree. It was days after I had discovered that our Garn ancestors had come from Kürnbach and also just a few days before Stan was slated to move back to the United States. Frau Dörlich had been most helpful to Stan during his short visit two years ago. When we arrived at the City Hall, we discovered to our disappointment that Frau Dörlich would not be at work that day. Having struck out in our attempt to speak with someone Stan had met with before, we decided to stop at the mayor's office to shake hands with him and tell him how much we loved the village. We stepped into the mayor's outer office and spoke with his secretary or assistant. We explained that we were visiting from the United States, that our ancestors were from Kürnbach and had left in the mid 1700s, that I had written a family tree book that included a section on Kürnbach as the family's ancestral home, and that we'd like to speak with the mayor for a moment. As we were talking with the secretary, we could see the mayor through the open door to his office. The secretary went into his office and spoke with him for a few seconds and then came back toward us closing his office door behind her as she left his office. She said that the mayor was familiar with my book and that he not available. I couldn't believe he didn't have 30 seconds to see us and shake our hands. I couldn't help thinking about my dad, a business man, and how he conducted himself in his business. Even if he had been in the middle of some big task, he would have taken 30 seconds to shake the hand of someone from another country, state or even neighboring county or town if a stranger had stopped by his office to speak with him. Dad would have taken time to hear a few words that they had to say and tell them it was nice to meet them. Some politicians could care less about people that they know cannot vote them out of office. 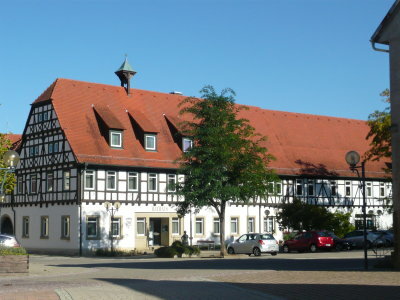 The village of Kürnbach has a web site which may be visited by clicking here. If you paste the URL/address into Google Translate, it will translate the pages into English. 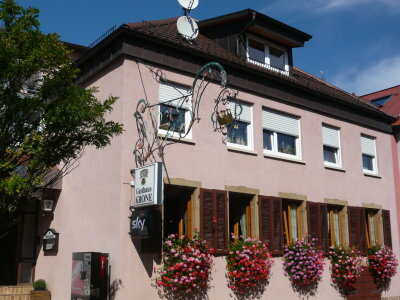 The picture below is the Gasthaus Krone or Krone Guest House. While we were in Kürnbach, we had a lunch there. The food was good and we were treated well there also. The most famous resident of Kürnbach is probably John Adam Treutlen, the first elected Governor of the State of Georgia in the United States after the Revolutionary War. He served as Georgia's Governor from May 1777 until January 1778. After his term as Governor, he got out of politics for a while. Then in early 1782 he decided to re-enter politics. However, in March 1782 five men rode up to his house, pulled him out and killed him in front of his family, possibly because of dissatisfaction among some over his re-entry into politics. The reasons for his murder are still not known for certain. Some speculate that he was killed by supporters of the British in the Revolutionary War who were angry over the outcome of the war and were seeking revenge. John Adam Treutlen was born in Kürnbach in 1734 to Hans Michael Treutlen and Maria Clara Job. His parents left Germany and came to Georgia in 1744 when John Adam Treutlen would have been about 10 years old. The picture below shows the building that was owned by John Adam Treutlen's father Michael or Hans Michael Tretulen. German naming conventions at the time dropped the first name Hans. John Adam Treutlen's father would have been known as Micheal Treutlen in the community. 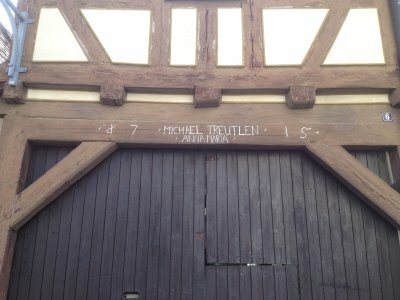 The inscription above the door indicates that the building belonged to Michael Treutlen and was built in 1715. Although the first digit of the year looks peculiar, it really is a "1" and is an example of the "1" that often appears as the first digit of a number. The name Treutlen also appears as Treutle today. The picture below is of Stan in front of the home of Michael Treutlen. The picture below is of me in front of the home of Michael Treutlen. The village has a nice little stream running through it. And there are many foot bridges that cross it. The picture below shows the stream and one of those foot bridges. Note the steeple of the church in the background. 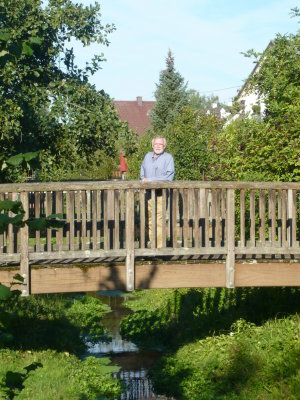 The picture below is Stan on one of the bridges going over the stream in Kürnbach. The picture below is me on one of the bridges going over the stream in Kürnbach. The pictures of the stream above suggest a slow stream with not a lot of water passing under the bridges. However, on a few rare occasions the water level has gotten high. The picture below shows a marker attached to the side of one of the buildings and the high water marks for several years when the village flooded. I had to take a picture of this sign at the base of one of the buildings. 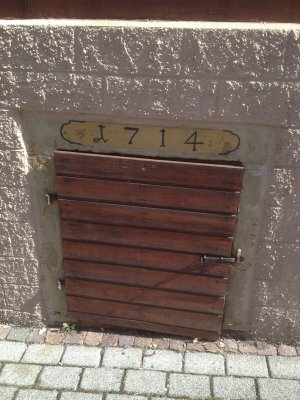 It indicates that the building was constructed in 1714. The reason this year is significant is that this is the year that our ancestor Johann Adam Gern was born. Adam Gern, as he would have been known, was the father of brothers Johannes Gern and Conrad Gern. Johannes Gern was the John Garn who settled in Bedford County, Pennsylvania, and died there in 1808. His brother Conrad Gern settled in Franklin County, Pennsylvania, where descendants today use the Garns spelling of the last name. Since Abraham Garn, grandson of Conrad Gern, married his second cousin Susan Garn, the granddaughter of Johannes Gern, I am a descendant of both Johannes and his brother Conrad Gern. The alert reader will notice the unusual "1" used for the first digit of the date. This is similar to the unusual "1" that appeared as the first digit of the date of the Michael Treutlen house discussed above. The cute little half-timber house shown below intrigued us. It was probably the smallest half-timber house in the village. And it was very well kept. When we first saw it, the sun was casting a dark shadow across it. Still we photographed it to be sure we got a picture. But we made a mental note to return later when the shadow would surely have diminished. Each time we passed the house, we stopped admired it some more and snapped another photograph. I suspect that the lady who lived there may have seen us and become concerned. She clearly recognized that we were not residents of the village. And it&apos;s even possible she could tell we were Americans. So it probably caused her some concern. Later when my friend Karlheinz Bers and his wife Christine was walking through the village, we passed by the home and the lady came out and spoke in German with Karlheinz. During their conversation she told Karlheinz about an interesting little rhyme or ditty that the children learned in grade school, which involved the Gern family. That rhyme or ditty is given later. 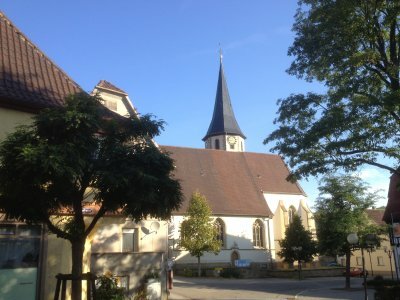 At the time when the Gern or Garn family lived in Kürnbach, the center of social activity in the village undoubtedly revolved around the church. 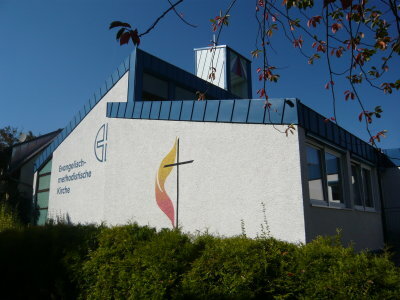 The picture below shows the church as it looks today. Parts of the church date back to when our ancestors lived there. 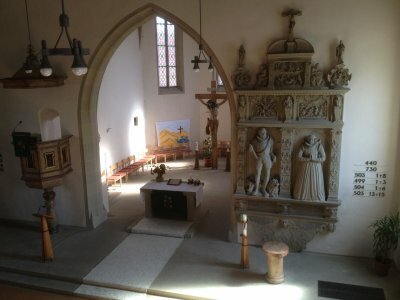 The Evangelische in Kürnbach has a web site which may be visited by clicking here. If you paste the URL/address into Google Translate, it will translate the pages into English. The pictures below show Stan and me with the Evangelische or Protestant Church in the background. 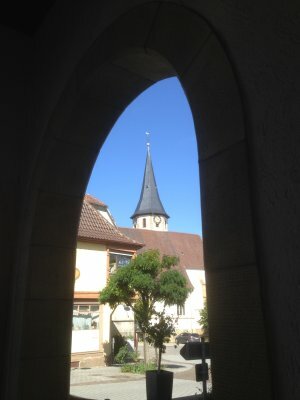 The picture below is of the Evangelische or Protestant Church seen though an archway near the church. 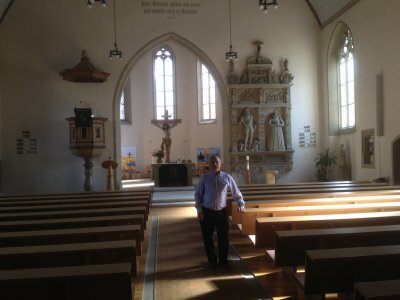 As soon as we realized that we would be in Kürnbach on a Sunday morning, Stan and I decided we wanted to attend the Sunday morning church service at the Evangelische. We had mentioned our intentions when we were talking with the Binders at the Kürnbacher Hof. We were disappointed when they showed us the church schedule on the local newspaper. Apparently the church shares the minister with a neighboring village. 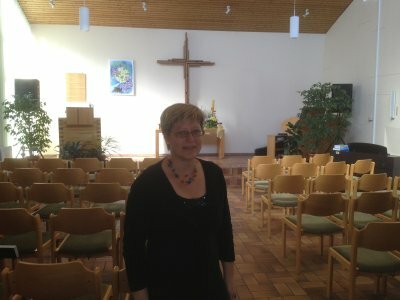 And the minister, a woman named Frau Ulrike Trautz, was scheduled to be at the neighboring church the Sunday morning we were in town. Fortunately the church was still open. So we went inside to see what the church looked like inside. Stan and I both had to have our pictures taken inside the church. 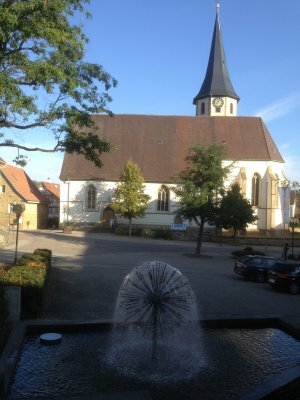 The picture below shows the front of the church as seen from the balcony of the church. The art work on the right that shows a man and a woman is a sandstone carving dating from around 1600 by an unknown artist. It depicts a local aristocrat, Bernard von Sternenfels and his wife Maria Agatha von Weitershausen. It is believed that the Sternenfels married into the Kürnbach family that had lived in the area from before the year 1250 and eventually either died out or moved away. The house owned by the Sternenfels is now a private residence in Kürnbach. Before leaving the church, I made sure I signed the guest book in my best German, telling people that we visited from the United States and that our ancestors were born in the village. Later that afternoon when my German friend, Karlheinz Bers, saw what I had written, he corrected a letter in one of my words. I think the letter I used gave a verb the wrong tense. I was glad for the correction. 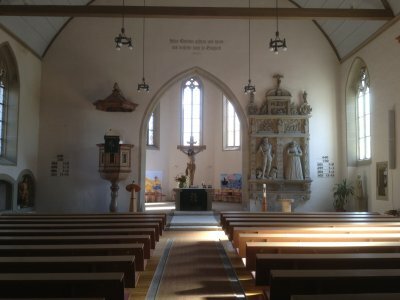 As we were walking around Kürnbach, we learned that there were two other churches, a Methodist Church and a Catholic Church in the village. We stumbled upon the Methodist Chruch several minutes after the service had finished. So we went in and found someone to talk with. The picture below shows the Methodist Church. At the Methodist Church we spoke at length with the lady shown below. She was happy to give us a tour of the entire church, showing us sanctuary, class rooms and the kitchen. She also was happy to tell us of all the activities they had for children. At some point during our talks, she sort of apologized for the size of the church, as though it might seem smaller than we might have expected. Apparently she had some vision of large churches in the United States and must have thought we probably expected a large church. Stan explained to her that when we were children, we actually had gone to a very small country church in the United States and that her church was much larger than the one we had grown up with. Earlier we mentioned that the region around Kürnbach is well known for it's wine and especially the Schwarzriesling wine or Pinot Meunier as the same wine is known in France. The region has been producing wine for many years. The oldest documents about Kürnbach are said to include references to wine grown in the region. And it is believed that the Romans introduced grapes and wine to the region when Rome ruled this part of Germany. The birth and christening records of our ancestors give the occupations of the fathers of the children who were born in the village. When Johannes Gern was born in 1738 and when his brother Conrad Gern was born in 1748, the occupation of their father, Johann Adam Gern, was listed as wine gardener. And when the births of Conrad Gern's children were recorded, Conrad's occupation was also listed as wine gardener. Johann Adam Gern's son and Conrad Gern's brother Johannes Gern probably also worked in the wine gardens. However, he married in America, where all of his children were born. So we don't have confirmation that he also worked in the wine gardens. 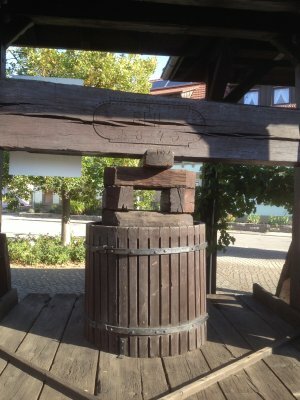 The picture below shows an old grape press that was used in making wine. The press belonged to the village and would have been used by all of the village's farmers who grew grapes. The date on the press is 1843. So it was first used well after the Gerns had left Kürnbach. However, the press used when the Gerns were there undoubtedly looked and worked very much like this press. 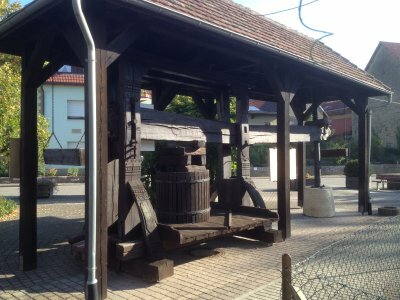 The picture below is another view of the grape press. Above the barrel for holding the grapes one can see the inscription with the date, 1843. The picture below shows Stan on the other side of the grape press. He's photographing some of the grapes on the grape vine growing next to the press. As Stan and I were admiring the grape press above and speculating about how it worked, we noticed a lady in the garden on the other side of the fence by the sidewalk next to the press. We attempted to ask the lady some questions and after a few halting attempts to communicate, she said that she would get her "Mann," who could speak English. A minute later a gentleman came out of the house beside the garden and introduced himself as Herr Dieter Velte. Herr Velte asked us if we had questions about the press. We talked for some time. And he answered our questions about the press. At some point he asked us if we would like to see a vineyard. Imagine how excited we were to hear him ask us that question. We already knew that our ancestors had worked in the wine gardens. 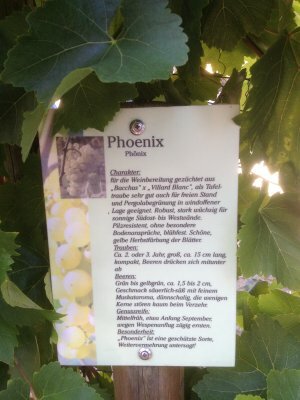 So one of our goals for our visit to Kürnbach was to also visit one of the vineyards and to learn about them. I'm sure Herr Velte noticed our excitement when he offered to take us to a vineyard. We were soon in his auto headed to the vineyard up the hill from the village. 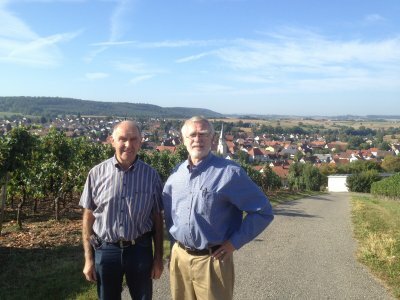 The picture below shows Herr Velte and me in the vineyard with the village of Kürnbach in the background. The church steeple is visible over my shoulder. 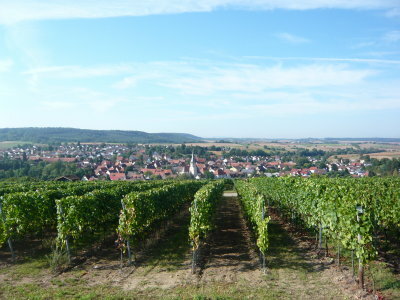 The picture below shows a view of the village of Kürnbach from the vineyard on the hill above the village. The steeple of the church is plainly visible. 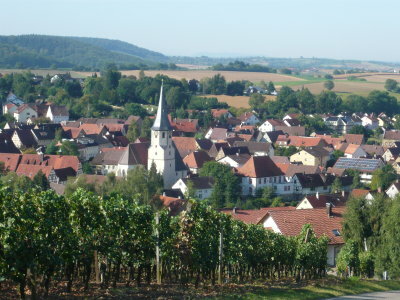 The picture below is another view of the village of Kürnbach from the vineyard on the hill overlooking the village. One can see the rows of grape vines in the vineyard. One can also see the steeple of the church in this view. The picture below is of Stan and me in the vineyard. It was at this point while we were standing there in the vineyard that I started thinking about how our ancestors must have walked this same ground and picked grapes from vines growing all around the place where we were standing. I had once heard from Philip Graham Garn, who wrote books in 1985 about the Garn family of Utah and their ancestors, that Phil's ancestor, Philip James Garn brought grapes to Utah from Ohio when he made the journey to Utah in 1855. At one time Philip Graham Garn had grape vines that came from cuttings of vines brought to Utah by his ancestor. Philip Graham Garn reported that the family tradition held that the grapes had been brought to Ohio from Pennsylvania by the Garns and that they may even have been brought to Pennsylvania from Europe by the Garns or Gerns as we now know the name was spelled in Germany. As I was standing in the vineyard, I couldn't help wondering if those grapes that Phil Garn once had at his home in Salt Lake City may have been "descendants" of grapes from Kürnbach and if they were the same variety as those around us in the vineyard. This picture shows some of the grapes in the vineyard. These undoubtedly were the Muskat Bleu variety that were pictured and discussed above. Every vine in the vineyard was loaded with grapes just the way this vine was loaded. We asked Herr Velte when the grapes would be harvested. He told us they would start the following week. And he told us he expected a good harvest. Looking at the grapes on those vines, it sure looked like he was going to get a lot of grapes in his harvest. 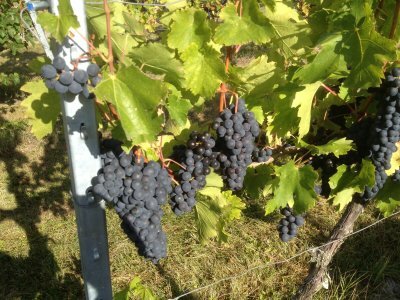 The quantity of grapes in a grape harvest is not the only thing that affects how good the harvest will be. Another factor is the sugar content of the grapes. 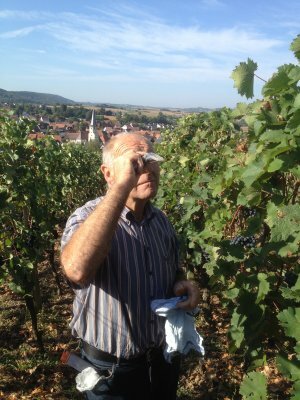 Herr Velte brought along with him to the vineyard a Brix Meter or refractometer to measure the sugar content of his grapes. The pictures below show Herr Velte rubbing juice from a grape onto the instrument and then looking through it. The sugar content of the grapes affects the index of refraction of the juice. When a thin layer of the juice is viewed through a refrectometer, a line appears between a dark region and light region of the little display. The position of this line depends on the index of refraction of the juice. Superimposed on the display and line is a scale with numbers that can be read to indicate the sugar content. Herr Velte was quite happy with the sugar content of his grapes. And he soon pulled a plastic bag from his pocket and started cutting bunches of grapes from the vines and putting them in the bag. Since he had been cutting lots of grapes from those vines, we became a bit concerned that someone might become unhappy that we were there in the vineyard messing with the vines and taking grapes. So Stan asked Herr Velte, "Who owns these grapes?" Herr looked up with a big smile and said, "I do. This vineyard is my hobby." At that point we were happy that he was putting those grapes in the bag for us. 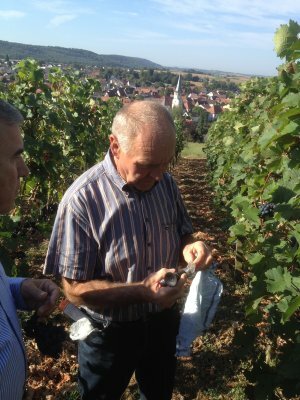 When we left the vineyard, Herr Velte drove us around the outskirts of Kürnbach and came into the village from a different direction. He wanted to show us more of the wine making process. 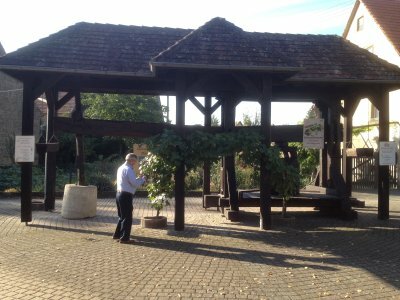 So he took us to the Winzergenossenschaft Kürnbach or Kürnbach Wine Growers Cooperative. The building in the picture below is the Cooperative. To the right of the building one can see a wagon. An aluminum bin can be seen between the wagon and the building. 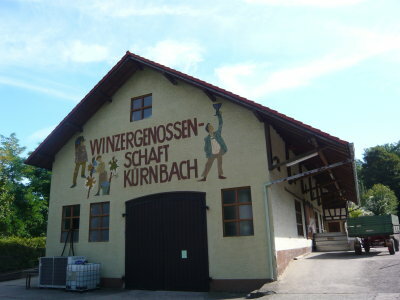 The picture below is another view of the Winzergenossenschaft Kürnbach or Kürnbach Wine Growers Cooperative. On the left is the green wagon that we pointed out in the previous image. And between the wagon and the building one can see the aluminum bin that we noted above. 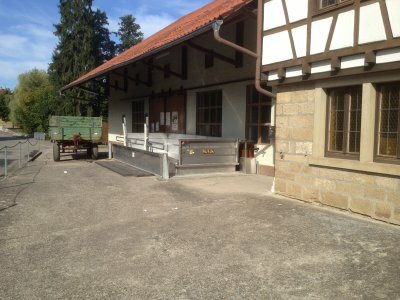 Pictured below is the aluminum bin at the Winzergenossenschaft Kürnbach or Kürnbach Wine Growers Cooperative. One can immediately see that it is more than an aluminum bin. It is the modern grape press used by the members of the Cooperative. During harvest time wagons pull up beside the bin and dump their loads of grapes. 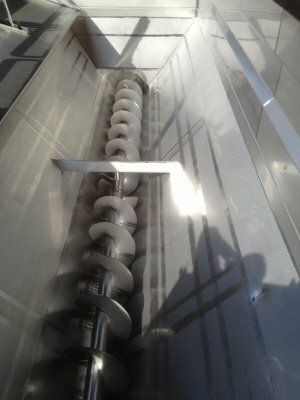 The screw in the trough turns and crushes the grapes letting the juice flow out the bottom of the press. 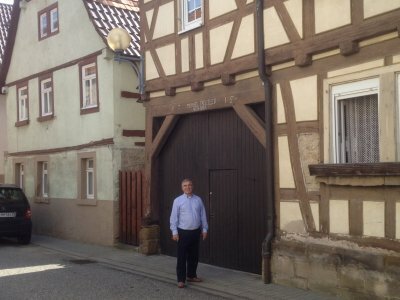 When we left the Winzergenossenschaft Kürnbach, Herr Velte took us back to his home and into his wine celler. There he had lots of bottles of wine. The bottles did not have labels. He pulled a bottle off of the shelf and handed it to us and told us it was Schwarzreisling wine. We were delighted. Initially I planned to bring it home with me. However, we had packed light with only carry-on luggage. And when we realized that a large unlabeled bottle of liquid would certainly raise suspicions at the airport and would certainly be confiscated by the Transportation Security Administration, we decided that we needed to drink the wine while still in Germany. A few days later we were at the Hotel Anna restaurant near Ramstein that Stan and Jan had gone to frequently during the seven years they lived in Germany. The owner/host, Nikko, knew Stan well. When Stan explained that we had the wine and would like to drink it at his restaurant, he brought out a bottle opener. He didn't have any problem with us bringing our wine into his restaurant. 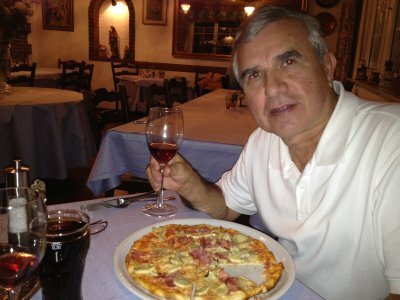 The picture below is of Stan with a glass of the wine and the pizza that he ordered for dinner that night. 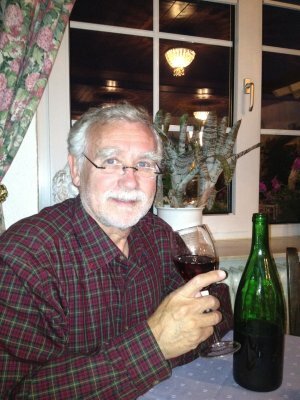 The picture below shows me holding a glass of the Schwarzriesling wine. We really enjoyed the wine. It was excellent. And it made me wish that I could buy some here in the United States. So far I haven't found a place to buy it. But I keep looking. 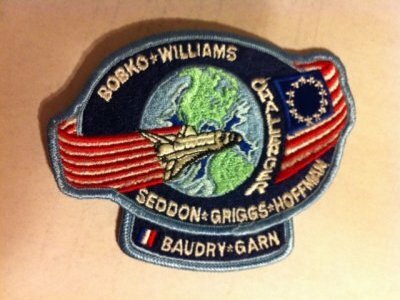 Before heading for Europe, Stan, knowing that we might meet some people that could be curious about the Garn family name, picked up a National Aeronautics and Space Administration or NASA patch for the shuttle flight that our distant relative, U.S. Senator Jake Garn took on flight STS-51-D aboard the Space Shuttle in 1985. Each NASA flight has a patch created for the flight which is worn on the suits of the astronauts and is also sold as a souvenir. Stan had an extra patch for the NASA flight that Jake Garn flew on. So Stan brought the patch along to give to someone in Kürnbach. After Herr Deiter Velte gave us the bottle of Schwarzriesling wine, Stan gave him the patch, which he appeared to appreciate. A photo of one of these patches is shown below. Before Herr Velte left the vineyard to take us to the Winzergenossenschaft Kürnbach or Kürnbach Wine Growers Cooperative, he took us to a memorial on the hill to the men of Kürnbach who had died in wars that Germany has fought. 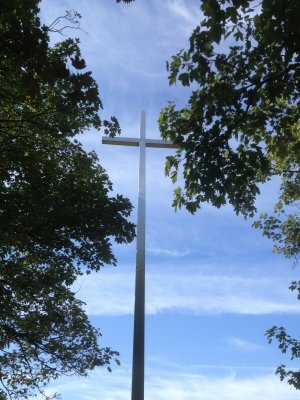 The picture below shows a cross that was erected at the memorial. 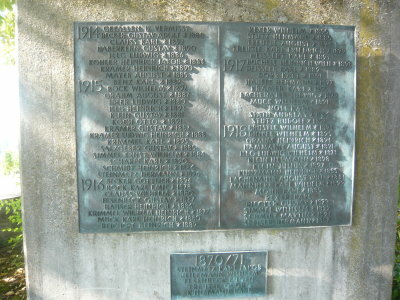 The picture below shows a large plaque with names of Kürnbach men who died in World War I. 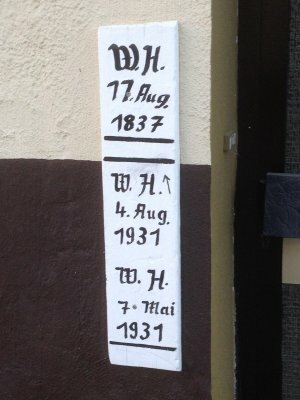 A smaller plaque shows names of men who died in the Franko Prussian War in 1870 and 1871 between France and regions that later became Germany. Two other plaques that are not pictured give names of men who died during or as a result of World War II between 1939 and 1947. The two other plaques have a total of 83 names, which is a huge loss for a village that had a population of around 2000 to 2500 people at time World War II was fought. The plaque shown below with the names of World War I dead has 62 names, also a large loss for the village. We did not see anyone on the list with the name Gern. One of the places that I wanted to visit while in Kürnbach was the village cemetery. I had seen in information about the Evangelische or Protestant Church that there was once a cemetery by the church and that it was removed and the ground terraced when renovations were made on the church. The time of the renovation appeared to be after our ancestors were in the village. So I did not hold out any hope of finding any Gerns in the village cemetery. Still, I wanted to visit just to make sure. 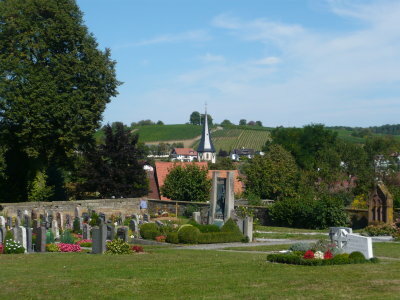 The picture below shows the cemetery in the foreground, the village in the middle and the vineyards and war memorial in the distance. The rows of grape vines are visible to the right of the church steeple. Just to the left of the church steeple sillhouetted against the trees that also are behind the steeple, one can see the cross in front of the Kürnbach War Memorial that was discussed above. The picture below shows me talking with villagers. Before visiting Germany I had heard stories that German burial customs are much different than our customs here in the United States. And someone I talked with in the cemetery confirmed how different the customs are. The person confirmed that burial plots are rented more or less and that they are reused after a while. For a person who is buried alone, the grave is maintained for 20 years before it is recycled. A couple is buried for 30 years before their graves are recycled. And a few "family" plots are maintained for 50 years before the graves are recycled. 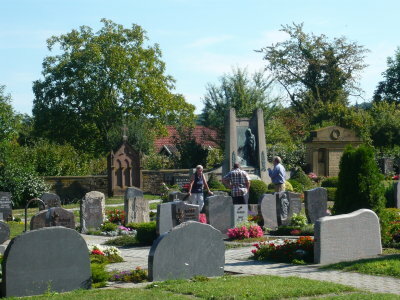 I was given the impression that the number of years that graves are maintained may vary slightly from village to village but that the times graves are maintained in the Kürnbach cemetery are representative of the times other villages maintain graves. There appears to be plenty of land in and around these villages. So the policy doesn't appear to be influenced by the availability of land. It has to be a choice based on long standing customs of the people. Incidentally, I did not find any Gerns who were buried there. All of the graves I saw were newer graves whose ages fell under the maintenance times we were told. When we were planning our trip to Kürnbach, we really hoped that we would be able to stay at the Kürnbacher Hof guest house. Knowing almost no German at the time, I hoped that someone at the Kürnbacher Hof could speak English. However, when I called and asked "Sprechen Sie Englisch," the person at the other end said, "nein." So I knew I needed to do something else if we were to stay at the Kürnbacher Hof. Years ago, when I worked for the government, I was part of NATO research study group that was a cooperative research effort among several NATO countries, including Germany. And the place in Germany that I used to travel was Ettlingen, which is very near Karlsruhe and about 25 miles or so from Kürnbach. One of the Germans who was a member of that research group was Karlheinz Bers. I interacted with him many times over the course of work in the group. Although I had lost track of him, I checked in a German phone directory and found someone named Karlheinz Bers in Leimersheim, which is not far from Ettlingen. 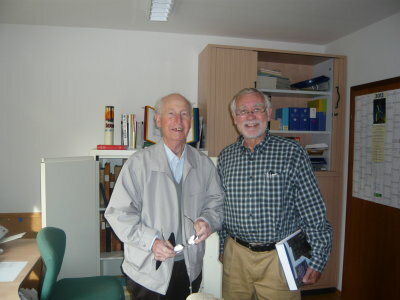 I wrote to him and was delighted to learn that the Karlheinz Bers of Leimersheim was the same person with whom I worked in the research group. 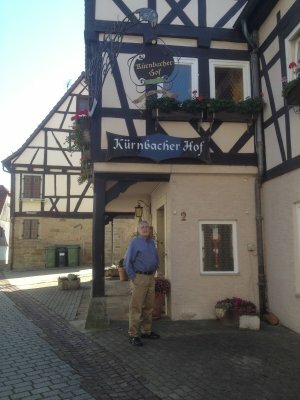 Karlheinz kindly called the Kürnbacher Hof on our behalf and reserved rooms for us. And after meeting the Binders at the Kürnbacher Hof, I realized that if Frau Binder had answered the phone, I probably could have made my reservation. 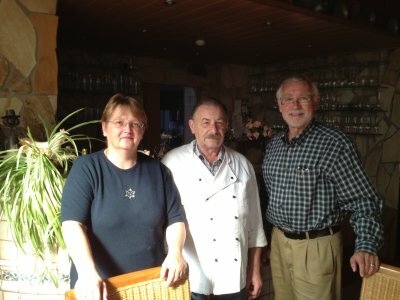 But we were grateful to Karlheinz for making sure our reservations were made correctly. 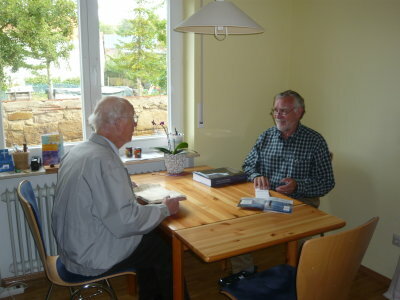 When Karlheinz learned that our family roots were in Kürnbach and that we hoped to learn more about the family while we were there, he offered to help. 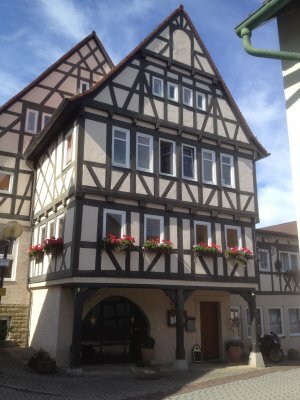 We made plans to meet Sunday afternoon and have dinner Sunday evening at the Kürnbacher Hof. Stan and I were walking in the village when I saw them drive past us. Karlheinz must have recognized me also because his car turned around immediately. 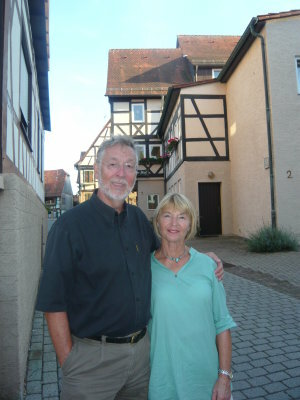 The picture below is of Karlheinz and his wife Christine in Kürnbach. Karlheinz was a big help. It is the younger Germans who are the most fluent in English. But it is the older Germans who know the history. And Karlheinz spoke with several of the older Germans and asked about the Gern family. Several people told him about an author and historian who was in a nearby home for the elderly. His name was Herr Reinhard Schmid. 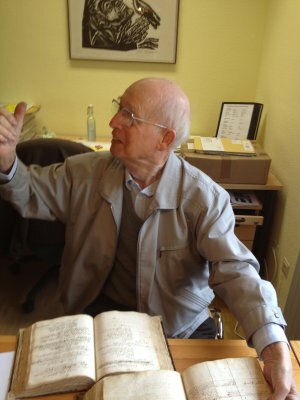 People also said that Herr Schmid was blind but that his mind was still sharp and that he could probably help us. I immediately recognized Herr Reinhard Schmid as the name of the person who had written the book about the guest houses in Kürnbach and the surrounding villages which I mentioned above. Upon learning the location of the home where Reinhard Schmid was living, we set off to find it. Karlheinz spoke with him at length and translated for me. 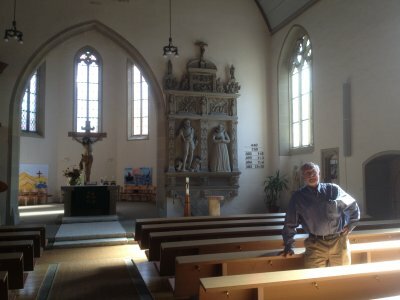 Herr Schmid recommended that I visit the church and speak with the pastor, a woman named Frau Ulrike Trautz. Herr Schmid said that Frau Trautz would call Herr Treutle, who was familiar with the old church records, and that Herr Treutle would help us. 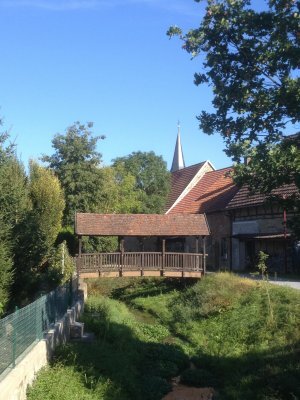 One very interesting thing that Karlheinz learned from Herr Schmid and from at least one other older resident of Kürnbach that we met as we walked around the village was a story about a rhyme or ditty that the children used to say years ago that involved the Gern family. Apparently the children years ago used to say a four-word sentence that they made up with the names of four families that lived in the village. The sentence they made up was "Gern Stutz den Bock." The names of the families were, "Gern," "Stutz," "Dehn," and "Bock." One will notice that the family name, "Dehn," was changed to "den" in the sentence. The two words sound the same. So they used "Dehn" as "den" in the sentence. And "Stutz" may be "Stutze." Loosely translated, this sentence means, "I like to dock (bob or cut off) the horns of that ram (male goat)." In this sentence "Gern" is an adverb meaning, "gladly" or "with pleasure" or in this case, "I like to." "Stutz" means to "bob," "dock," or "cut off." It is implied that horns are being cut off. The word "den" means "that." and "Bock" means "ram." This sentence had to have originated some time in the mid 1800s or before since it appears that the Gern family was gone from the village by 1900. So the ditty had to have been passed from older school children to the younger children in order for the people of the village to remember it today. I was delighted to learn of the Garn or Gern family's inclusion in this little ditty. One of the things that Karlheinz brought from his home in Leimersheim when he came to Kürnbach was pictures of two of the international groups that he and I had worked on. The research study group that I mentioned before was named Research Study Group 9. Host countries always took a photograph of the group some time during the meetings held by the group. And the photo below is a photo of the attendees at one of the early meetings that I attended in Ettlingen, Germany, at the Forschungsinstitut für Informationsverarbeitung und Mustererkennung, Forschungsgesellschaft für Angewandte Naturwissenschaften which translates to something like Research Institute for Information Processing and Pattern Recognition, Research Establishment for Applied Science. I was surprised that I still remembered the names of most of the members of the group. 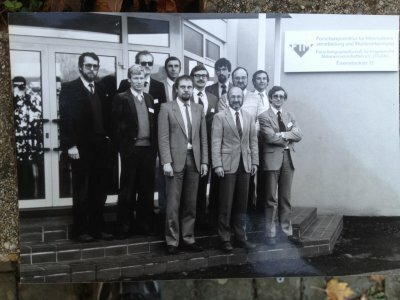 The names of the people in the picture, from left to right are: Karlheinz Bers, Germany; Stein Grinnaker, Norway; Christian Birkemark, Denmark; John Knecht, China Lake, United States; Peter Fritsche, Germany; Lynn E. Garn, Night Vision Lab, United States; Helmut Stengel, Germany; Manfred Bohner, RSG-9 Chairman, Germany; Leandre Sevigny, Canada; Jean Pierre Gambotto, France; and Richard Cowderoy, England. 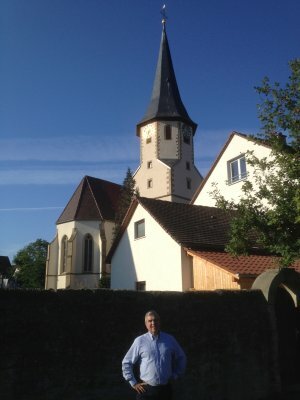 During the whole time I was traveling to Ettlingen, Germany, for these meetings, I did not know that my Garn ancestors had lived within about 25 miles from the place where the meetings were being held. I certainly wish that I could have visited Kürnbach when I visited Ettlingen. It was about 15 years after my last visit to Ettlingen that I learned how close the Garn ancestral home was to Ettlingen. 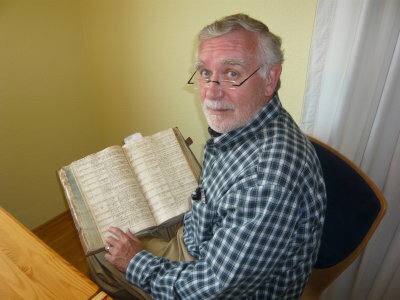 I was quite pleased with all of the information that Karlheinz gathered for us while we visited in Kürnbach, especially the rhyme or ditty and the information about who to talk with at the church and the suggestion by Herr Schmid that we involve Herr Treutle in our research. Karlheinz was a big help. And Stan and I enjoyed talking with his wife also. So as Karlheinz and his wife left us Sunday evening, we were looking forward to Monday morning and a visit to the church. Monday morning around 9am we set off for the church in search of Frau Trautz, whom Herr Schmid had told Karlheinz Bers we should speak with at the church. Although a German Frau refers to any married woman in Germany, our stereotype of a Frau is an older woman. So when we approached several people working outside the gate to the residence at the church and asked for Frau Trautz, we were surprise when a young lady said that she was Frau Trautz. After explaining our reason for visiting, she said that she would call Herr Richard Treutle to see if he was available to help search the records. Frau Trautz then opened a huge floor safe with a combination lock and showed us a row of very old books, which were the old church records. When Herr Treutle arrived, Frau Trautz explained our interests whereupon Herr Treutle pulled several books out of the safe. 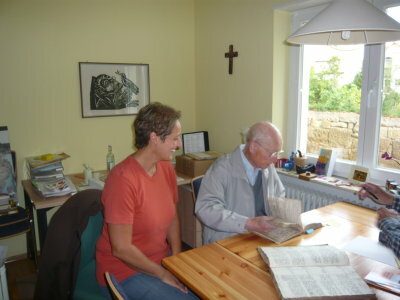 The picture below shows Frau Trautz and Herr Treutle as we were starting our search among the old books. Herr Treutle did not speak English and Frau Trautz kindly translated to get us started. Before even going to Kürnbach, I had seen microfilms of some of the records there. The Mormon Church had filmed them and added them to their library many years ago. So I had seen pictures of some of the records on the microfilms already. And I had used some of them in my book on the Garn family. However, I really wanted to see the books themselves. One thing that I was not expecting however was to see another book that the Mormon Church did not microfilm. That was the Kürnbach Families Book or, "Kürnbach Familien Buch," as shown in the photo below. I had never seen this book with its lists of families all grouped under the name of the head of the family. I quickly searched for my Gern ancestors. I found the families of Johann Adam Gern and Conrad Gern. I was pleased to discover that I had not made any mistakes in the family groups that I compiled from the other records. 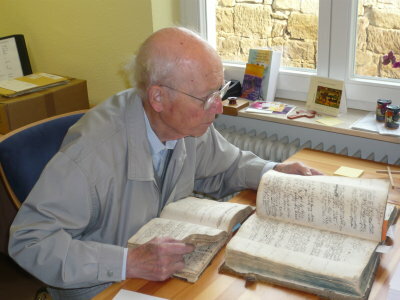 The photo below shows Herr Treutle cross checking names between the Kürnbach Familien Buch and the books of vital records. I wish I could remember what discovery Herr Treutle made that caught our attention. This picture shows him summoning us to see his discovery. 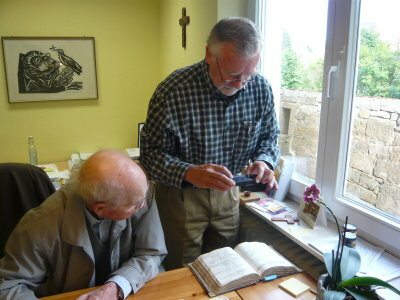 This picture shows Herr Treutle and me at work at the table in Frau Trautz' study at the church. 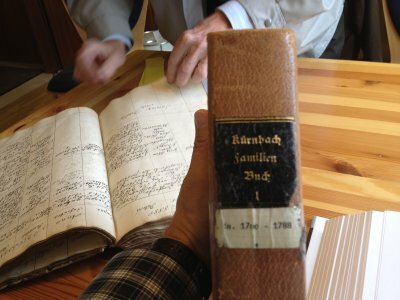 In the photo below I am photographing some records in the Kürnbach Familien Buch as Herr Treutle looks on. I was grateful that he was so familiar with the records and could point me to them quickly. Before visiting Kürnbach I had known of John Adam Treutlen, Kürnbach's famous son who moved to Georgia in the United States and became the first elected governor of the state after the United States gained independence from Great Britain. At some point Herr Richard Treutle wanted to know if I had ever heard of the Kürnbach resident who later became governor of Georgia. He was quite pleased that I already knew the story. I had already suspected that Herr Treutle was somehow related to the governor. So I asked him. It turns out that Herr Treutle's ancestor, a Philip Treutlen I believe, was a brother of Michael Treutlen, the father of John Adam Treutlen, the governor of Georgia. 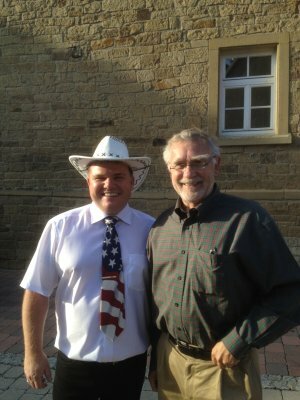 The photo below is of Herr Treutle and me trying to discuss his relationship to the governor. 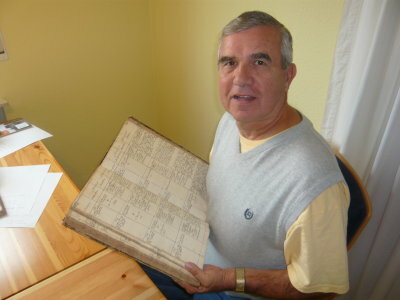 Th photo below shows Stan holding one of the old church record books with births and christenings of our Gern ancestors. 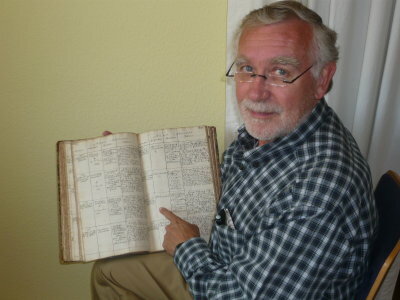 The photo below shows me pointing to a birth and christening record in the old church record book. The record I am pointing to is that of Johannes Gern, who was born on 3 March 1738. The photo below shows me pointing to a birth and christening record in the old church record book. The record I am pointing to is that of Conrad Gern, who was born on 4 March 1748. Conrad was a younger brother of Johannes Gern whose record is mentioned in the photo above. The photo below shows me pointing to a birth and christening record in the old church record book. The record I am pointing to is that of another Johannes Gern, who was born on 16 August 1780. He was the son of Conrad Gern whose record is mentioned in the photo above. I'll note here that the Johannes Gern who was born in 1738, whose record is shown a couple of photos above, had a granddaughter named Susanna Garn. This Susanna married her second cousin Abraham Garn, who was the grandson of Conrad Gern above. Abraham's father was the Johannes Gern who was born in 1780 whose record is shown above. Abraham and Susanna Garn's son Martin Garn was Stan and my great-grandfather. At the end of several hours of research Herr Treutle and I were pleased with what we had accomplished. I wanted another picture of the two of us, which is shown below. 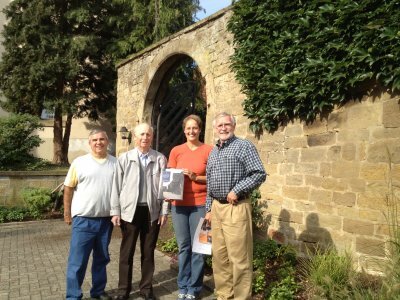 The picture below shows Stan, Herr Treutle, Frau Trautz and me in front of the gate to the minister's home at the church. Frau Trautz is holding a copy of my book on the Garn family. At this point I feel compelled to note an error that some people have made when recording geographical information about Kürnbach for family tree records, particularly on the Ancestry.com web site. For some reason or other people have been reporting that Kürnbach is located in the Biberach District of the Baden Württemberg State of Germany. This is WRONG! Biberach is a district located in the eastern part of Baden-Württemberg. As noted above, the GPS coordinates of Kürnbach are 49.078104N, 8.845232E. And it is obvious that Kürnbach is located in the Karlsruhe District, a District on the western side of the Baden Württemberg State of Germany. There happens to be a "Museumdorf Kürnbach" located in Bad Schussenried, which is in the Biberach District. But this is just a museum that shows a small village from the past much as the Plimoth Plantation in Plymouth, Massachusetts, shows a village like the one that the Pilgrims might have lived in. The museum in Bad Schussenried has absolutely nothing to do with the Kürnbach church where the Gern records are located. I actually asked several people in Kürnbach to name the district where Kürnbach is located and all reported Karlsruhe as the district. So if you run across a record that reports Kürnbach, Biberach, Baden-Württemberg, Germany, as the way to reference the place where the Gerns originated in Germany, you can know that the people citing Biberach as the District are wrong and have not done their homework. As mentioned earlier, our visit to Kürnbach was the highlight of our trip to Europe. I would love to visit the village again.